Polar Dual Zone Wine Cooler 92 Bottles. Ideal for Restaurant, Hotel, Public House, Home and Commercial establishment. 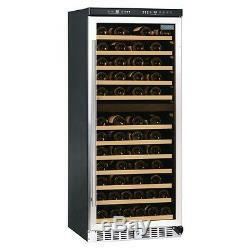 Large capacity wine cooler cabinet that incorporates two independently controlled temperature zones. This wine cooler fridge has an LED showing the the unit is at correct temperature for sparkling, white or red wine storage. Cools and heats to maintain the perfect storage conditions. Frost-free with interior circulating fan. Dimensions 1445(H) x 595(W) x 570(D)mm. Power Type 220-240V, 180W, 1.4A. Temperature Range +5°C to +22°C. The item must be in original package and unused condition. 25% reinstocking apply for returning unwanted goods to cover high transport cost. This is your responsibility to return the goods back to us. We always endeavour to deliver the item ordered in as quick a time as possible. They generally manage to keep their promises on such things, but we are always in their hands once the goods have left our warehouse. In the rare event that a delay occurs in your item being delivered, all the companies we deal with have specific procedures and timescales for investigating lost or delayed parcels. We CANNOT short circuit that procedure and unfortunately you will have to abide by their terms. When you place an order with us, you accept these conditions as part of your contract. It does not include negotiating lifts or stairs. This is customer responsibility to check that products ordered will fit through doorways and into their premises. We cannot accept responsibility if it will not fit. Telephone Number : 0121 386 6628. (c) By cheque Payable to. (d) Bank Transfer (BACS) to. The customer will in the event of agree cancellation indemnify the Company in full against all expense and loss incurred up to the time of cancellation in accordance with the following formula namely. The customer cancels after the Goods have left the Company's warehouse but before they have been unpacked by the customer a charge of Twenty percent (20%) of the invoice value will be charged plus any carriage charges incurred by the Company at the time of cancellation. If the customer cancels after the Goods have left the Company's warehouse and the goods they have been unpacked by the customer a charge of Twenty Five percent (25%) of the invoice value will be charged plus any downgrading amount necessary together with any carriage charges incurred. CATERINGBASE LTD STANDARD TERMS AND CONDITIONS OF SALE. In these Terms and Conditions: the Supplier means CateringBase the Customer means the person ordering Goods from the Supplier. The Goods means the Goods supplied by the Supplier to the Customer. 1.1 All orders are subject to these terms and conditions. 1.2 The Supplier reserves the right to decline any order. The Supplier does not warrant the suitability of goods for specific applications. 2.1 All prices quoted exclude VAT and installation charges; these will be added to the invoice (where applicable). 2.3 The Supplier reserves the right to change the advertised price before acceptance of an order. 3.1 The Supplier will use its reasonable efforts to deliver the Goods promptly. Deliveries on Saturdays or at other specific times or locations outside mainland UK are subject to extra charges. Such charges are subject to quotation. This Clause does not apply to any Goods specifically ordered for manufacture for the Customer where Clause 1.6 then terms only shall apply. 3.3 Goods delivered are used, stored and installed at the Customer's own risk and CATERINGBASE Ltd will not be liable for any damage, loss or disruption caused by the same. 3.4 All large machinery, refrigeration and flat packed Goods are delivered to the front door of ground floor locations only. (b) By direct debit transfer to: Account Name: CATERINGBASE Ltd HSBC Bank plc, 130 New Street, Birmingham, B2 4JU Sort Code: 40-11-18 Account No: 14605926. 4.4 Title to the Goods shall not pass to the Customer until all sums due at any time and on any account to the Supplier have been paid. 5.1 The Supplier undertakes to use reasonable endeavours to ensure that the Goods are supplied as advertised. The Supplier reserves the right to supply alternative Goods equivalent to those advertised or specified. 5.2 The Goods are supplied at competitive prices and thus (dependent upon the price), the Goods are supplied with either. 5.7 All warranties and conditions whether implied by statue or otherwise are excluded from this Contract to the extent permitted by law provided that nothing in this Contract shall restrict or exclude liability for death or personal injury caused by the negligence of the Supplier. No liability of any kind is accepted for any oral representation of any kind by the supplier or its personnel. 6.1 All gas appliances must be installed by a Corgi registered engineer as required by law. 6.2 All glass and dish washers or other electrical appliances must be installed by a suitably qualified engineer. Coffee machines must be installed by a qualified coffee machine engineer. 6.3 All ice machines and all refrigeration equipment must be installed by a suitably qualified refrigeration engineer. 6.4 The Customer shall supply the Supplier with documentary proof of appropriate installation within 14 days of installation of the Goods. 6.5 The Supplier does not effect installation of any Goods included in the published or invoiced price of the Goods. The Supplier will offer the service of its subcontractors for the purposes of installation of any Goods. All installation costs are invoiced separately either by the Supplier (if agreed to by the Supplier) or by the Suppliers sub-contractor (if negotiated between the Customer and such sub-contractor). The Supplier accepts no liability of any kind for any errors in installation howsoever caused or where no proof of appropriate installation is provided within 28 days of supply. 6.6 Icemakers, coffee machines, glass and dishwashers must be installed with a water softener in hard water areas. 7.1 The Supplier shall not be liable for any failure to deliver the Goods arising from circumstances outside the Suppliers control. 7.2 Non-exhaustive illustrations of such circumstances would be act of God, war, riot, explosion, abnormal weather conditions, fire, flood, strikes, lockouts, Government action or regulations (UK or otherwise), delay by suppliers, accidents and shortage of materials, labour or manufacturing facilities. LEASED OR FINANCED GOODS Where Goods are supplied subject to a leasing or HP agreement. 8.3 The Customer is liable to pay a deposit equal to 3 months installments which is non-refundable if for any reason the lease documentation is not completed. Telephone calls may be recorded and used for training and/or monitoring purposes. Calls are charged at the national rate, unless otherwise stated. No waiver by the Supplier of any breach of the Contract by the Customer shall be considered as a waiver of any subsequent breach of the same or any other provision. The Contract shall be governed by and construed in accordance with the law of England. If no damage is noted, any subsequent claims will not be acc epted. CATERINGBASE was formed in 2007 with the help of 10 years experience that its' founding directors possessed in hospitality sector and supplying industry catering equipment solutions. Our aim is to provide a simple, affordable price and quality equipment to the customers. We constantly reviewing our product and services to ensure our customer always get the best deal in the marketplace. Invested in Staff and New System. The growth in the company is so visible and we moved into the new Office Building in 01 February 2009. The new Office was equiped with better specification and allowing us to increase our productivity and provide high standards and levels of service to our customer. Sign up for our Newsletter. The item "Polar Dual Zone Bottle Wine Cooler Chiller 92 Bottles 1445Hx595Wx570Dmm" is in sale since Friday, June 30, 2017. This item is in the category "Business, Office & Industrial\Restaurant & Food Service\Refrigeration". The seller is "cateringbase" and is located in Birmingham. This item can be shipped to United Kingdom.